When Tim Ho Wan opened its doors in the Philippines, people have been lining up at the “world’s cheapest Michelin-star restaurant” day in and day out. You can’t reserve a table so you have to devote some time in waiting. Since it opened its first branch in our country in 2014, I haven’t got the chance to taste their widely-popular dim sums. Luckily, we stayed very near 112 Katong Mall in Singapore and at early in the afternoon on a weekday, there wasn’t any queue at Tim Ho Wan. Excited to get blown away with “Hong Kong’s Most Famous Dim Sum”, I dragged my husband inside the Katong branch. The ambiance was good, the restaurant was clean, although I feel like we weren’t given a comfortable seat for two people. It was like a shared table with another group, despite the restaurant having numerous empty tables. Unlike 126 Dim Sum in Geylang, Tim Ho Wan had a simpler menu, a one pager placard. The staff handed us an order sheet and a pencil, and then we just checked what food and drinks we wanted. 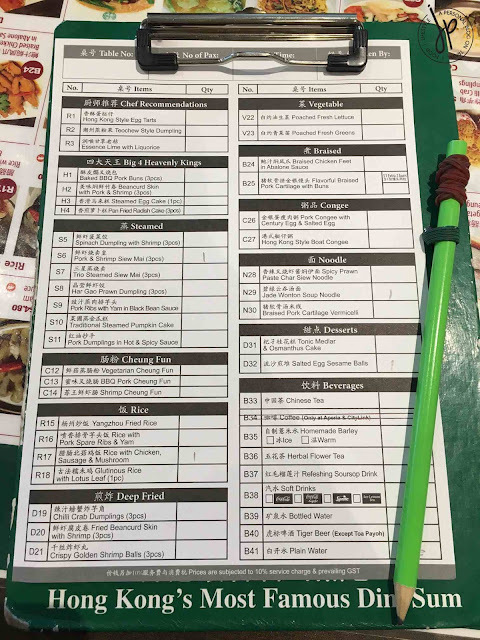 The order sheet is divided into several categories like steamed dumplings, rice, deep fried, vegetables, congee, noodles, and more. 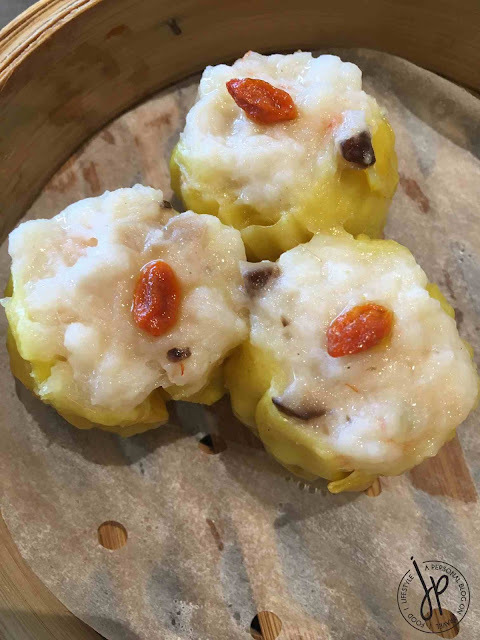 As a standard in my quest for the best dim sum, the first on my list is Pork and Shrimp Siew Mai. While it was really good, I don’t think this is the best I tried so far. But then again, you can taste from every bite that it’s freshly made. 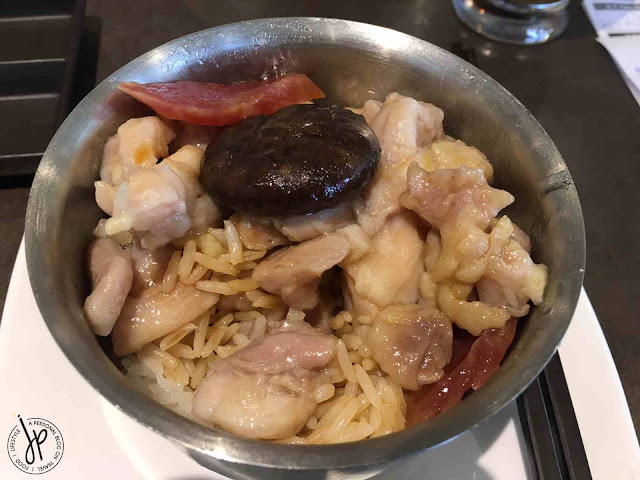 For a hungry man, my husband ordered Rice with Chicken, Sausage & Mushroom. I haven’t had a spoonful of his order, but I know he liked it really well. I was craving for noodles at that time and with that, I ordered their Jade Wonton Soup Noodle. 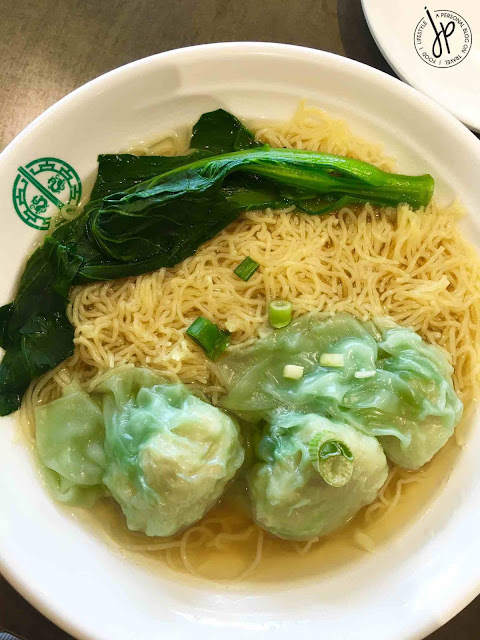 I’m not sure if the recipe is the same for Tim Ho Wan all across branches in HK, Singapore, or the Philippines, but I didn’t like this noodle at all. It was so bland, that I didn’t finish my bowl of noodles. Obviously, I won’t order this again. Our final order as part of their dessert offering is their Salted Egg Sesame Balls. If there’s one part of Tim Ho Wan’s menu that’s mind blowing for me, this is it! 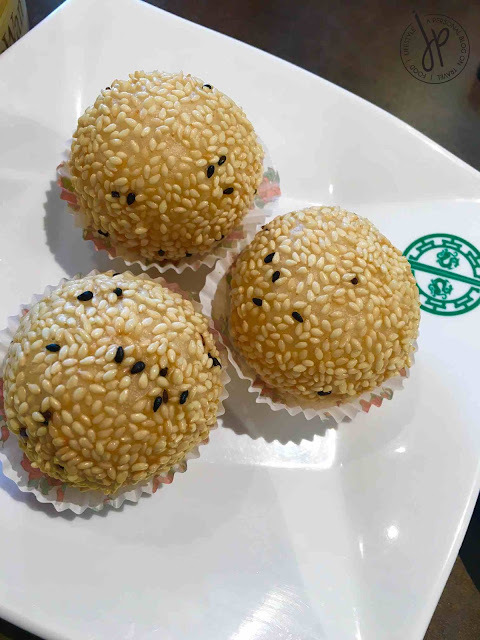 To those who love eating buchi in the Philippines, this is like a level-up version of it. 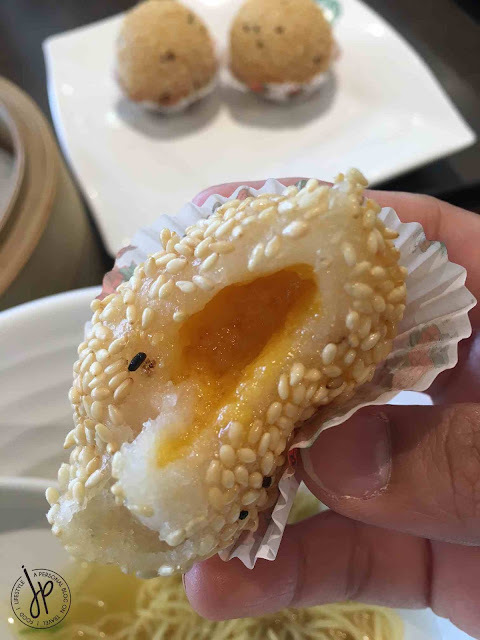 It’s soft and tasty, and the molten salted egg is a real delight. 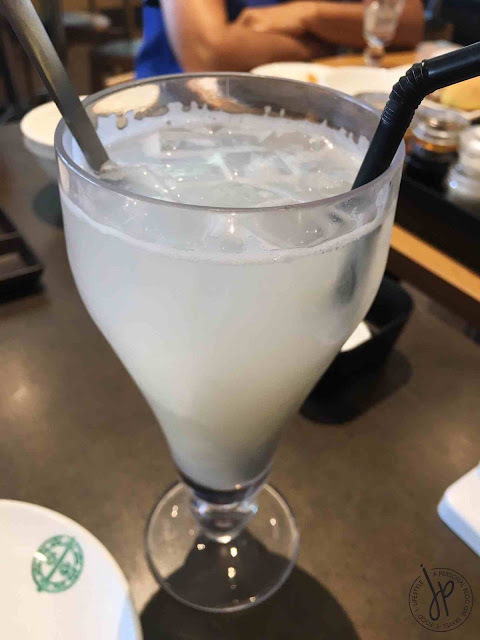 What I like about Tim Ho Wan (and the rest of the fruit stands in Singapore) is that they serve Soursop juice (Guyabano juice). I don't normally eat Guyabano, but the juice they serve has the right blend of sourness and sweetness at the same time. I believe they serve fresh juice free from artificial sweetener. So how was my first dining experience with the “world’s cheapest Michelin-star restaurant”? For me, it was okay. It wasn’t as impressive as I thought it would be, but maybe because we didn’t pick their most popular food on the list. 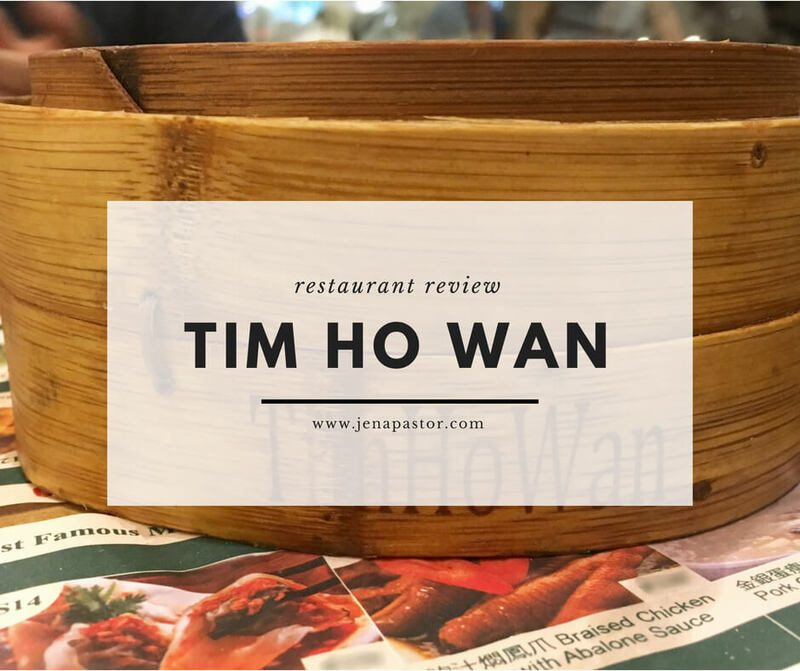 Will I visit Tim Ho Wan again? Absolutely. I’d definitely skip their noodles and try out their most popular baked buns next time.